Each day, 6 missions are assigned from the list below at random and 3 new missions gets added after mission is cleared. Avoid collecting hearts or collecting friend’s batteries until all missions are revealed. Challenge and win a Normal Battle 3 times. Challenge and win a Night Battle 1 time. Challenge and win an Emergency Battle 2 times. Rescue 10 T-Dolls in total from missions or battles(Auto-Battles do not count). Consume T-Doll Contract * 4 in total. Consume Equipment Contract * 4 in total. Consume Quick Production * 4 in total. Consume Quick Repair * 4 in total. Consume Manpower * 1,500 (Auto-Battles do not count). Consume Ammo * 1,500 (Auto-Battles do not count). Consume Ration * 1,500 (Auto-Battles do not count). Consume Parts * 1,500 (Auto-Battles do not count). Collect batteries from a friend’s Dorm 10 times. 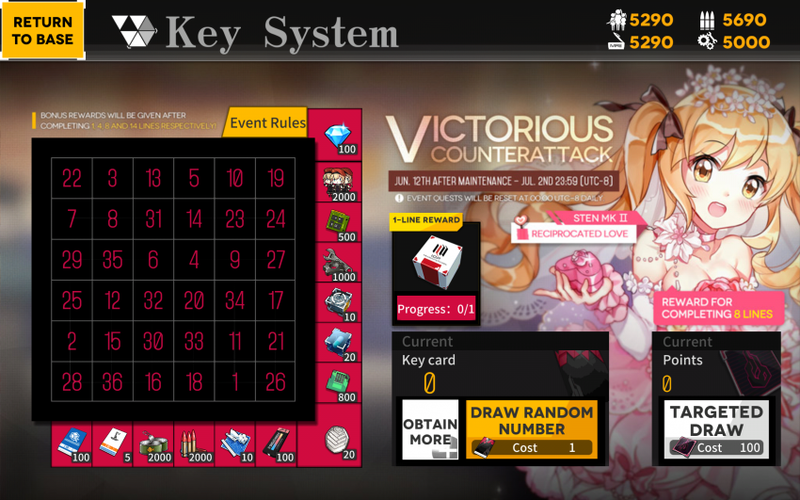 Collect 10 hearts in total (from T-Dolls and Kalina). Obtain Handgun T-Doll * 3. Obtain Submachine Gun T-Doll * 3. Obtain Assault Rifle T-Doll * 3. Obtain Machine Gun T-Doll * 3. Obtain Rifle T-Doll * 3. Obtain body gear * 3. Obtain Quick Production * 1 from Logistic Support. Obtain Quick Repair * 1 from Logistic Support. Obtain Equipment Contract * 1 from Logistic Support. Obtain T-Doll Contract * 1 from Logistic Support. Eliminate 5 bosses in victorious battles. Eliminate 10 armored machine type S.F. enemies in victorious battles. Eliminate 20 normal machine type S.F. enemies in victorious battles. Eliminate 30 normal human type S.F. enemies in victorious battles. Accumulate 12 hours of completed Logistic Support. Perform 2 Combat Simulations in total. Clear 10 battles with S rank. Like others’ Dorms 20 times in total. Give 10 gifts in total. Consume Battery * 100 in total. Use a friend’s Echelon 3 times in total. Consume Calibration Ticket * 30 in total. Area 4 Night Missions Coming Soon! Good post. I be taught one thing more challenging on different blogs everyday. It would all the time be stimulating to read content from other writers and apply a little bit something from their store. I’d desire to make use of some with the content on my weblog whether you don’t mind. Natually I’ll provide you with a link on your internet blog. Thanks for sharing.